Alexa Fund’s First Restaurant Tech Investment and ORDER. EAT. PAY. This edition of MRM's News Bites features OpenTable, Grubhub, SevenRooms, DoorDash, Great North Distributors, Sodexo, Plantible Foods, Apptizer Inc., Geopath and Allresto. OpenTable unveiled the pilot of a new centralized reservation feature for restaurant groups within its flagship product, GuestCenter. 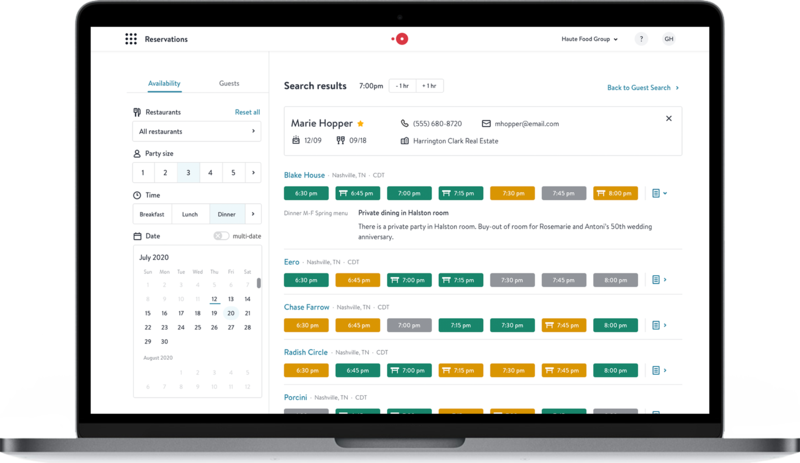 This new reservation view is the first in a suite of features designed to streamline operations through group-level tools for planning, management, and business intelligence; all in one dedicated group platform. "We've listened to our restaurant partners, observed a growing need to centralize operations, and understand the increasing pressures of managing the bottom-line in today's food and beverage industry. Elevating levels of hospitality while increasing operational efficiencies is our shared goal, and we are pleased to announce that operators can now do this with greater ease within GuestCenter," said Jon Morin, Senior Director of Product Management at OpenTable. "With a central platform to manage and monitor reservations and new group-level metrics and features, the feasibility of moving to a centralized operating model just got easier for all groups." This GuestCenter group platform works for a wide-range of hospitality groups, from sister-restaurants and multi-unit brands, to nationwide restaurant chains, hotels and resorts. The new features provide these groups with a top-down view of their overall operation, a way to manage user access at the group level, and view and book availability across all restaurants. "The ability to manage our restaurant operations all in one place within GuestCenter at both the restaurant level and group level is essential for us to understand our operation at any given time," said Giselle Constante, East Coast Reservations Manager, Nobu. "The intuitive layout of the centralized reservations feature allows us to cross-sell between restaurants and very quickly see what availability they have, which is really helpful for us to run more efficiently." This collection of features will allow operators to seamlessly flow between group and restaurant-level views, book and cross-sell availability across all restaurant locations, easily manage guest profiles and reservations, control user access to both restaurant and group features, and run group-level reports on more than 50 distinct data points. Barbara Lynch Collective, Boka Restaurant Group, The Broadmoor, Farmers Restaurant Group and Nobu Restaurants are just a few of the groups already using these new features. Restaurant groups can find out more about GuestCenter and the centralized reservations feature by visiting here. Grubhub continued its expansion of delivery capabilities to dozens of new markets across 19 states nationwide. These new markets join the others announced earlier this year, totalling the expansion of delivery capabilities to more than 100 new markets in 2018. Restaurants in these new markets can now provide delivery using Grubhub's driver network, opening up new customer and revenue streams. Diners already using the Grubhub platform can now get increased menu choices in their neighborhood – whether it's a calzone from Mama Roni's in Fort Collins, CO, the banana pudding from Bonfire BBQ in Asheville, NC, or a classic favorite from a well-known brand. SevenRooms secured investment from Amazon’s Alexa Fund to introduce in-service, voice-enabled technology for the restaurant industry. The funding marks the first investment the Alexa Fund has made in a restaurant technology company, and will pave the way for SevenRooms to integrate Amazon Alexa into its restaurant operations and guest relationship management experience. SevenRooms is a front-of-house technology company entirely focused on empowering operators to establish and maintain a direct relationship with their guests. Building on its proven track record of delivering best-in-class tools for restaurant operators and a deep understanding of front-of-house operations, the company will leverage the Alexa Skills Kit (ASK) to build an Alexa skill that enables restaurant operators to use a wide array of voice commands for everyday in-service use. For example, managers could ask Alexa about the guests sitting at table 12, while servers could ask if any guests in the dining room have allergies. The technology will help operators create a more personalized experience for their guests at an instant, without having to lift a finger. Understanding guest data and having immediate access to the correct information through Alexa can help a restaurant make every guest feel like a regular more easily, converting a one-time diner into a frequent guest. “Voice-powered technology is already impacting every industry, and continues to play a central role in the daily lives of consumers and the businesses they interact with,” said Joel Montaniel, Founder and CEO of SevenRooms . “At SevenRooms we are always looking at ways our technology can streamline operations while personalizing and humanizing the guest experience. Hospitality operators have long relied on an interface or screen to access information, taking attention away from their guests and operations. Voice eliminates this need, enabling them to shift their attention back to what matters most: the guest. We are excited to leverage this investment from Amazon to bring Alexa to SevenRooms, furthering our mission of enabling high-touch hospitality by creating powerful tools that are invisible to guests, but invaluable to the operator. DoorDash, the on-demand destination connecting customers with their favorite restaurants through door-to-door delivery, today announced its launch in the Charleston area, delivering from more than 950 local restaurants. DoorDash currently operates in more than 1,200 cities across the country. Customers in the area can order DoorDash between the hours of 11 a.m. and 10 p.m. from a wide selection of restaurants including Red Lobster, Applebee's and Wendy's. "We love our South Carolina community and are delighted to open up our platform to seven new cities in the state with this launch," said Tony Xu, CEO and Co-founder of DoorDash. "We've had our eye on the Charleston area for some time and are thrilled to now offer local residents delivery from some of their favorite neighborhood restaurants." Great North Distributors, Inc. (Great North)—Canada’s first national sales broker for legalized adult-use cannabis—launches its first official day of cannabis sales across Canada. With a dedicated team of sales professionals, Great North is poised to support sales of legalized cannabis among provincially owned and operated retailers and private retailers, in accordance with the various provincial regulations and legal sales schedules. Great North is the exclusive manufacturer’s representative for Aphria Inc., one of Canada’s lowest cost cannabis producers. The company will leverage its unparalleled sales network and established retail relationships to immediately begin sales of Aphria’s broad range of cannabis products. Great North will also apply its industry-leading data analytics capabilities to the new cannabis industry, providing suppliers and retail customers with a powerful data-driven approach to cannabis sales. Sodexo launched its North American Single Use Plastics Reduction Plan that will eliminate single use plastic bags and stirrers by 2019, polystyrene foam items such as cups, lids and food containers by 2025, and shift straws to a "by request" item that will still be available to customers who need them while moving toward more sustainable materials. "As a company serving consumers in universities, workplaces, hospitals, schools, stadiums, and so many other venues, we understand both the potential impact we can make through a commitment to reduction and the real benefit that some of these products bring to people every day," said Ted Monk, Vice President for Corporate Responsibility at Sodexo. "We believe there's tremendous room for reducing waste without having a single person who uses our services feel like they are being excluded." 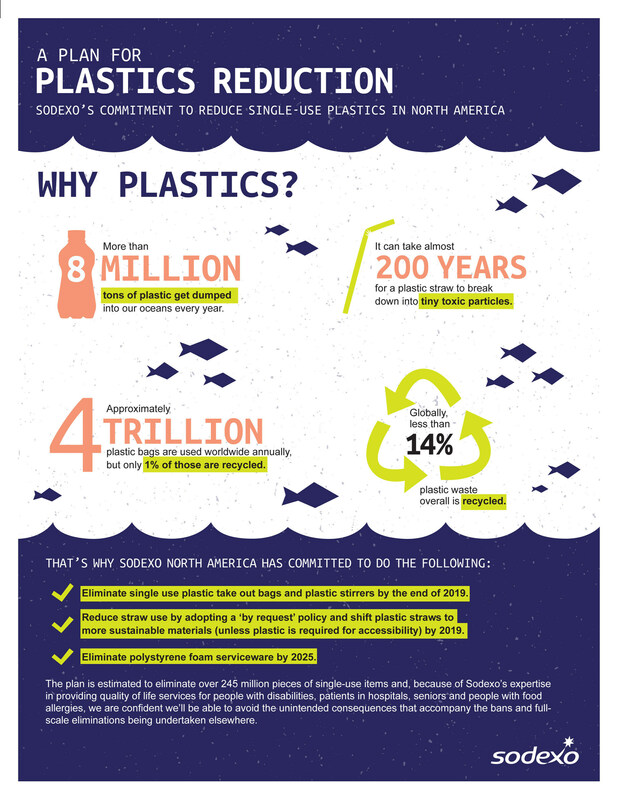 This Single Use Plastics Reduction Plan is merely one step in Sodexo's global effort to reduce environmental impact, as the company will continue to research and introduce new innovations such as re-usable materials, bioplastics, and organic materials in its effort to eliminate avoidable waste going to landfills. "We support efforts to prevent waste. However, it's important to remember that for many people, these aren't convenience products, they are necessities. We're happy to provide Sodexo with guidance that ensures their facilities are fully inclusive of people with disabilities and are fully accessible to everyone," said Jill Houghton, President & CEO of Disability:IN. Sodexo's policy will eliminate over 245 million pieces of unnecessary single use items. For plastic straws and stirrers alone, the reduction plan will eliminate a volume of plastic straws and stirrers that, if laid end to end, would reach from North Pole to South Pole…twice. "Single-use plastic waste often ends up in nature, and has a devastating effect on species," said Erin Simon, Director of Sustainability R&D at World Wildlife Fund, United States. "Sodexo's plan to phase out unnecessary single-use plastics is an important first step in their commitment in tackling the plastic waste crisis." "Sodexo's comprehensive plan to reduce its reliance on single-use plastic will have major benefits for the environment and human health," said John Hocevar, a marine biologist with Greenpeace. "Eliminating styrofoam is a huge step forward. We also applaud Sodexo for committing to invest in solutions that involve re-use and not just other throwaway items." Plantible Foods completed a pre-seed funding round led by Unshackled Ventures, an early stage fund for immigrant-founded startups based out of Silicon Valley. The amount was not disclosed. Located in San Marcos, California the company was originally founded in Netherlands by Tony Martensand Maurits van de Ven. As the company grew, they moved their operations to the United States. Apptizer Inc. introduced its ORDER. EAT. PAY. table ordering solution for small and midsize restaurants. ORDER. EAT. PAY. Gives guests control to seamlessly order food and drinks without waitstaff assistance or involvement. Guests simply access the ORDER. EAT. PAY. solution right from tables to select menu items, customize and place orders, pay and more. With Apptizer’s ORDER. EAT. PAY., establishments can improve the guest experience to enhance satisfaction and loyalty, increase table turnover, enhance revenues, and gather information about what is being ordered and how people pay to make better business decisions. “We are pleased to announce the addition of ORDER. EAT. PAY. to Apptizer’s app-building product set,” stated Dinesh Saparamadu, Apptizer CEO and founder. 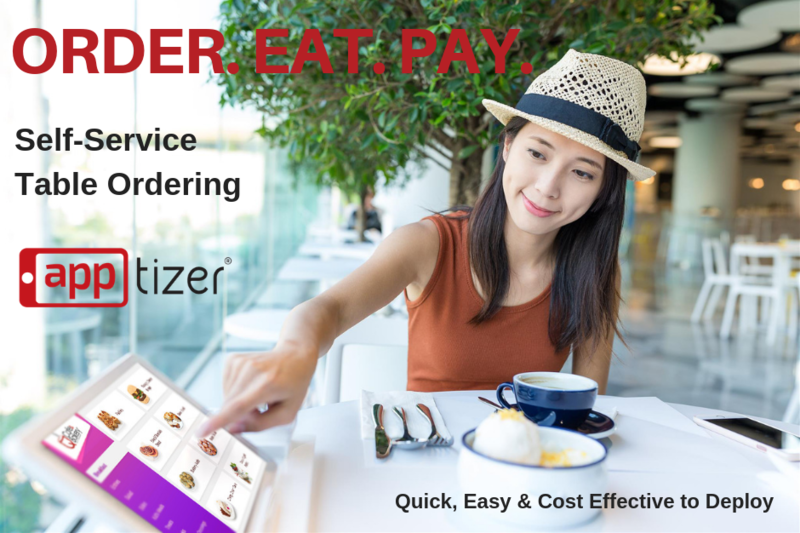 “Apptizer solutions give restaurant owners the means to quickly and cost-effectively deploy in-demand, self-service mobile, kiosk and tableside channels so they can effectively compete with sophisticated, large-scale restaurant chains,” added Saparamadu. ORDER. EAT. PAY. and other Apptizer solutions can be downloaded from the App Store, Google Play, Clover App Market or the company’s website, and work with First Data Clover, Poynt, Verifone Carbon and Elo Touch devices. Certified with all the top payment processors, Apptizer solutions are also compatible with Apriva, Expinet (iPayment), plus NMI Creditcall and white-label payment gateways. Geopath, a not-for-profit organization which uses audience location data and media research to analyze out-of-home (OOH) advertising, announced updates to the Geopath Insights Suite, their enhanced ratings and audience measurement platform that provides the standard currency for the OOH industry. Currently available to Geopath members, the new Insights Suite enables media planners, advertisers and owners to precisely profile and target desired audiences across a variety of OOH advertising formats. Available across all devices, the new platform incorporates state-of-the-art audience insights, market research, and location-based data to inform national campaigns, hyperlocal campaigns and custom geographies. The data set is continually growing, and will include tens of thousands demographics and insights drawn from consumer behaviors, purchase history and psychographics in addition to specific points of interest including shopping centers, airports, restaurants and movie theaters. The Geopath Insights Suite aggregates anonymous data from hundreds of millions of mobile devices, connected cars and GPS sources allowing for audience segmentation across various OOH media channels. These enhanced datapoints allow buyers to more accurately target and purchase specific geographical locations, including mobile fleet and place-based advertising. For media owners, the deeper demographic and behavioral data enhances their audited ratings and selling capabilities. Avoiding food waste and saving money – while promoting sustainability: Allresto, the Munich Airport subsidiary responsible for most of the airport's food and beverage operations, has launched a pilot project to test a new app: "Too Good To Go". This digital platform lets airport visitors, passengers and employees order surplus food prepared by restaurants and other food service establishments at special reduced prices for pick-up between 8:00 and 9:30 pm. 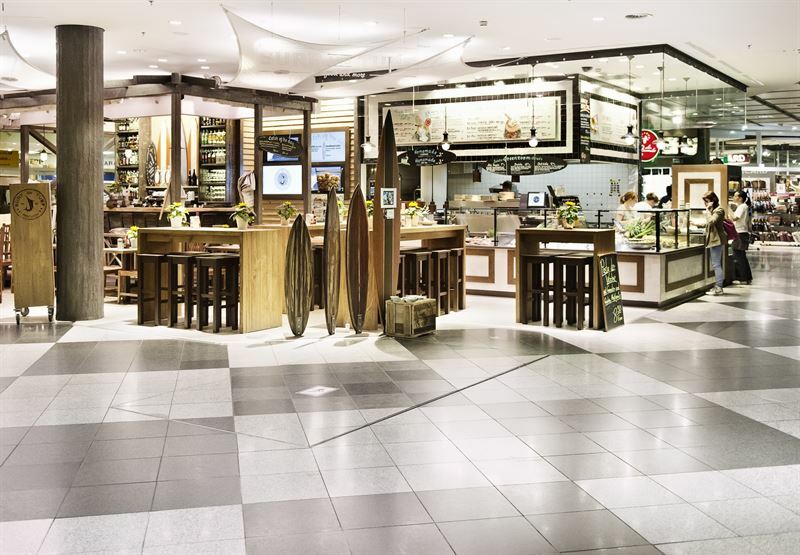 The first restaurant at Munich Airport to join the pilot project is Surf & Turf, top photo, in the Munich Airport Center (MAC). The app is the brainchild of a Danish start-up and is now up and running in nine countries. So far more than 10,000 food service locations and over 5 million users have been won over by the idea of reducing waste by selling extra food at reduced prices. After logging on, users see a list of participating stores with appetizing offers in their area, including prices. The app also processes orders and payments. When an order is placed, the meal is ready for pick-up at the store or restaurant location within the indicated time window. The responsible treatment of resources and climate protection are central priorities under Munich Airport's corporate strategy. In that context, the airport has a diverse range of measures . In particular, it has set the target of achieving carbon-neutral airport operations by 2030. "Too Good To Go" is the latest building block in the airport's sustainability concept, and is simple enough to be expanded quickly and easily to other restaurants and cafés at the airport.